The Washington Post &bull; The Philadelphia Inquirer &bull; The Christian Science Monitor &bull; St. Louis Post-Dispatch. Everyone wants to define the man who signed his name "A. Lincoln." In his lifetime and ever since, friend and foe have taken it upon themselves to characterize Lincoln according to their own label or libel. In this magnificent book, Ronald C. White, Jr., offers a fresh and compelling definition of Lincoln as a man of integritywhat todays commentators would call "authenticity"whose moral compass holds the key to understanding his life. Through meticulous research of the newly completed Lincoln Legal Papers, as well as of recently discovered letters and photographs, White provides a portrait of Lincolns personal, political, and moral evolution. White shows us Lincoln as a man who would leave a trail of thoughts in his wake, jotting ideas on scraps of paper and filing them in his top hat or the bottom drawer of his desk; a country lawyer who asked questions in order to figure out his own thinking on an issue, as much as to argue the case; a hands-on commander in chief who, as soldiers and sailors watched in amazement, commandeered a boat and ordered an attack on Confederate shore batteries at the tip of the Virginia peninsula; a man who struggled with the immorality of slavery and as president acted publicly and privately to outlaw it forever; and finally, a president involved in a religious odyssey who wrote, for his own eyes only, a profound meditation on "the will of God" in the Civil War that would become the basis of his finest address. Most enlightening, the Abraham Lincoln who comes into focus in this stellar narrative is a person of intellectual curiosity, comfortable with ambiguity, unafraid to "think anew and act anew." A transcendent, sweeping, passionately written biography that greatly expands our knowledge and understanding of its subject, A. Lincoln will engage a whole new generation of Americans. It is poised to shed a profound light on our greatest president just as America commemorates the bicentennial of his birth. 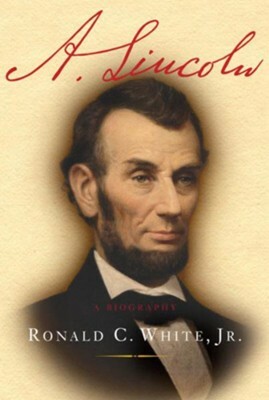 Ronald C. White, Jr., is the author of two bestselling books on Abraham Lincoln: The Eloquent President and Lincoln’s Greatest Speech, a New York Times Notable Book. White earned his Ph.D. at Princeton and has lectured on Lincoln at hundreds of universities and organizations, and at Gettysburg and the White House. He is a Fellow at the Huntington Library and a Visiting Professor of History at UCLA. He lives with his wife, Cynthia, in La Cañada, California. I'm the author/artist and I want to review A. Lincoln: A Biography - eBook.